I was very pleased with how even my stitches came out this time. Although I thought my cast on edge was rough, I was assured by some more experienced knitters that it was decent and wouldn’t even be noticeable after usage. 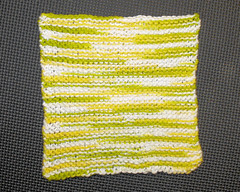 I also made my first attempt at blocking with this piece, and it is definitely more square now than it was previously. DrQuuxum and I went to Harbor Freight the other evening. It’s a dangerous, dangerous hardware store – I have never left without buying something. I found a plastic container meant for storage of nuts and bolts and such. Examination proved that the vertical dividers could be removed, leaving the long horizontal rows. Although the larger sizes of my 14 inch knitting needles did not quite fit (so close! ), I have a set of bamboo needles (ten pair) that are an odd 12 inch and a little that fit in perfectly. The other find of the night was a set of interlocking foam floor mats; I had been searching for such a set since seeing them used for blocking knitting on a friend’s flickr. All the craft stores I had asked said “those would be really smart for us to carry, nope don’t have any,” and the toy stores all wanted at least $50 for them. Harbor Freight = $10 for a set of four. I love that store. The current garter stitch project I think I started on needles too short. It may end quickly and I’ll call it a bookmark. 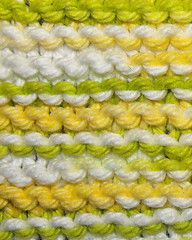 The next one will be a dish towel from the same yarn as this dish cloth, done on circular needles of the same size, so that the striping is vertical on the towel.